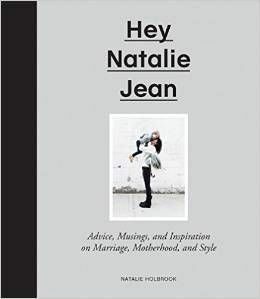 HEY NATALIE JEAN: HUCK TURNS FOUR! 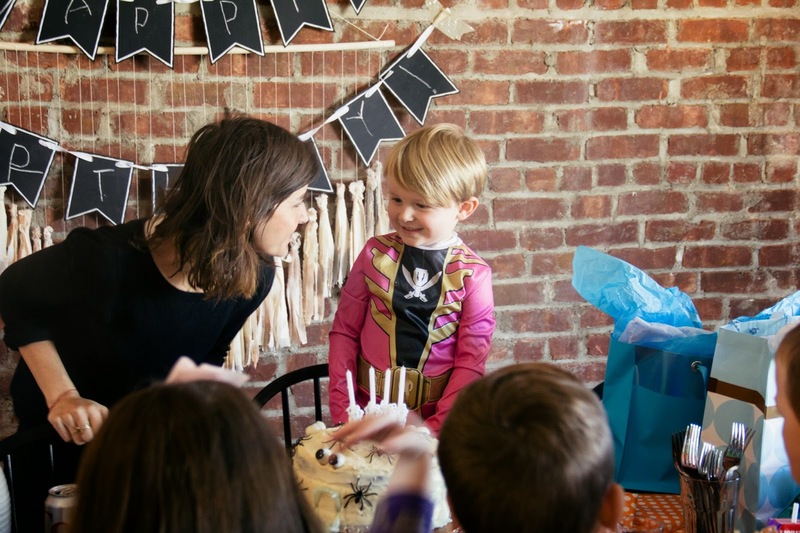 Huck has the honorable distinction of having been born a Halloween baby, and as such will always have a fall-back plan in place for all his future birthday parties in case he runs out of ideas for the rest of his natural born life. :) Kid, you are welcome for that! 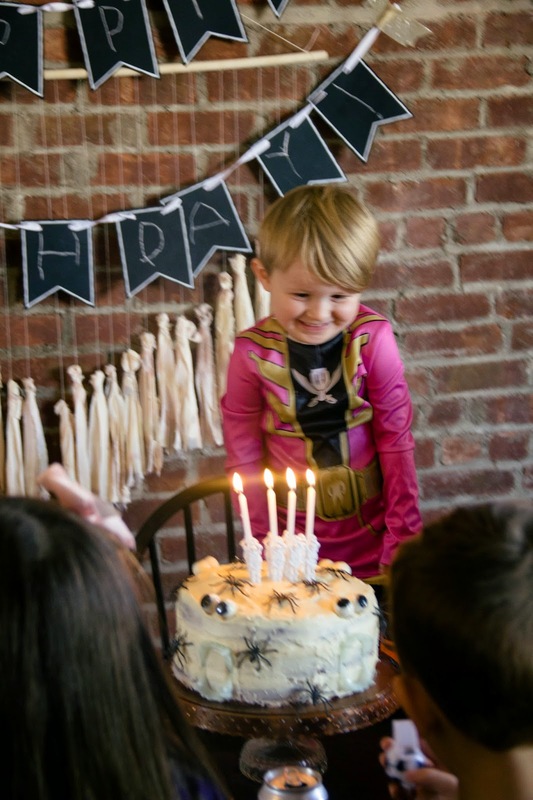 PS--Huck did his own lettering on his birthday banner. Can you get over that? Stud. 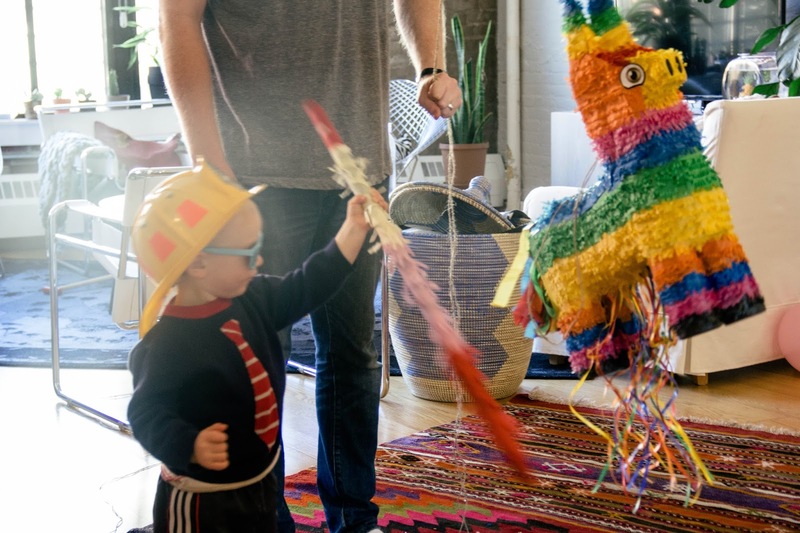 We finally got to employ the piñata we'd had sitting around in the kitchen for the past few months (that's a long story). 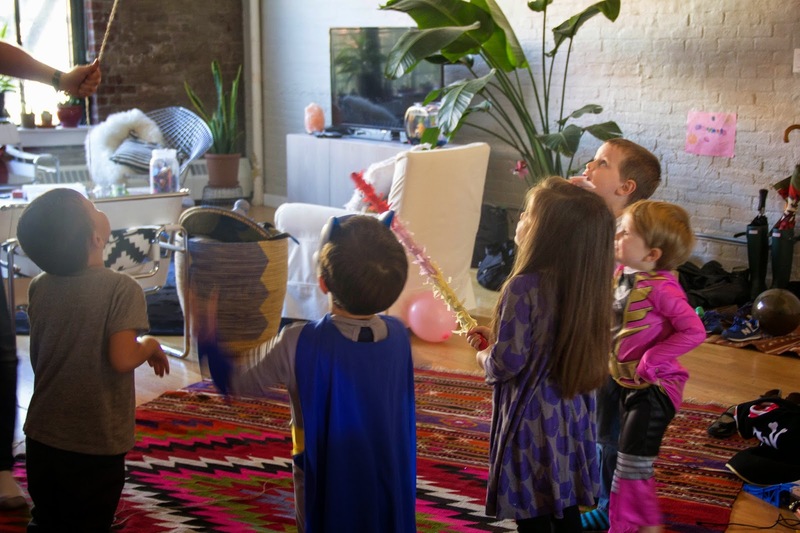 After some last minute waffling, Huck settled on attending his party as the Pink Power Ranger. 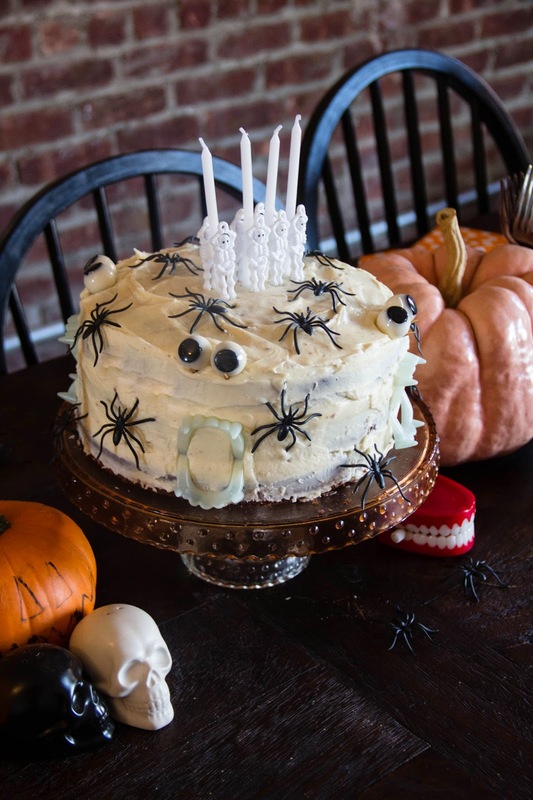 Working on a zero-hour schedule, we did a quick Devil's food cake, decorated with glow in the dark fangs and squishy eyeballs (all from Target! 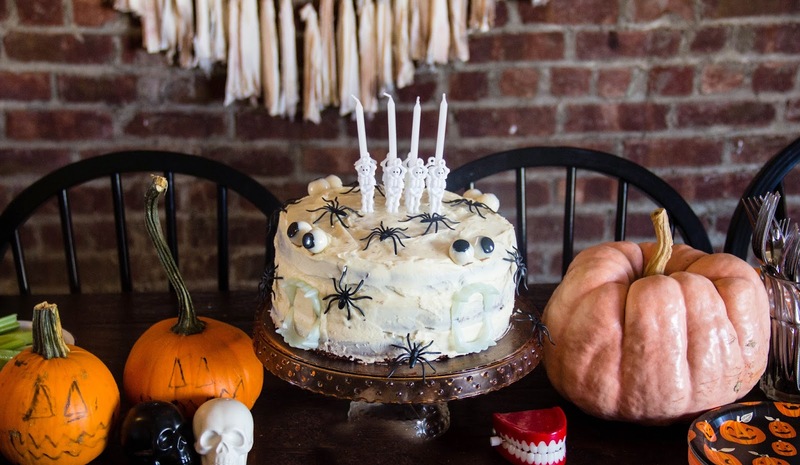 ), and topped off with four birthday candles propped up by four plastic skeletons. Some toy bugs strewn about for whatever, and taduh! Now. Will you look at this. I am not kidding here with this bit. I later asked Huck what he wished for, and he said he wanted a ninja sword, and a baby sister. Clearly I'm biased here, but you guys, this kid is such a dreamboat. 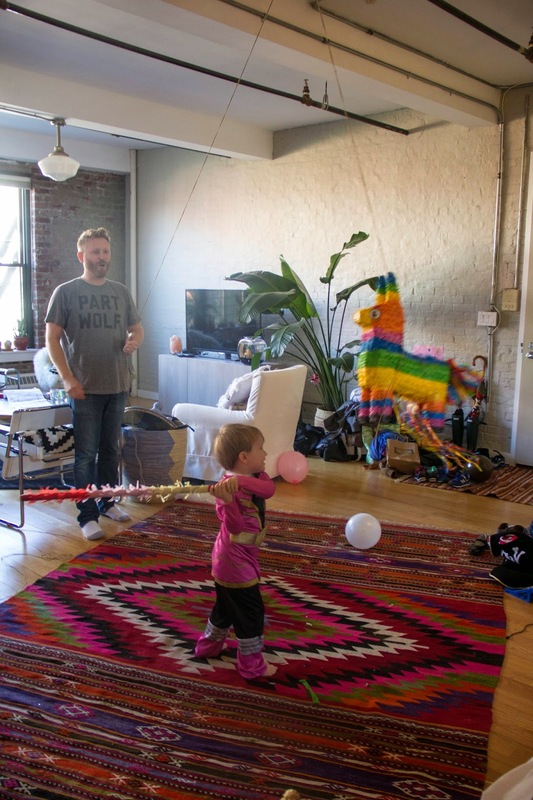 Now, four-year-olds and piñatas . . . 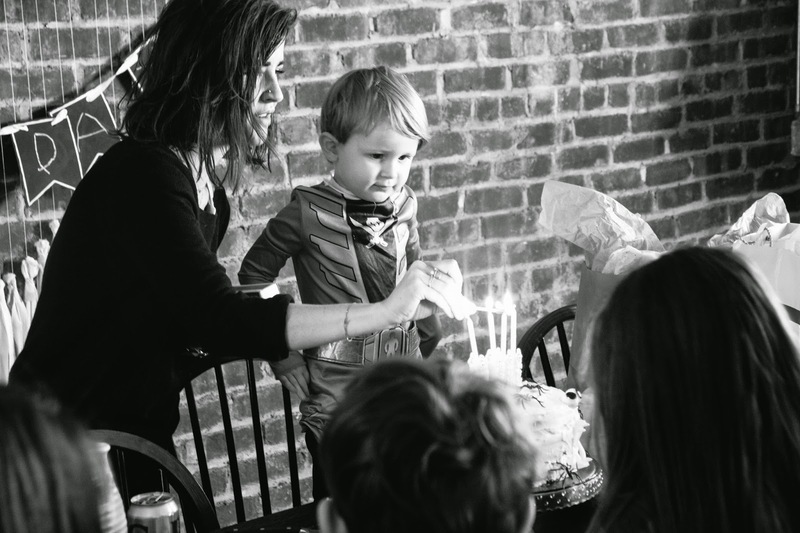 There was this moment during the party when Huck was blowing out his candles that I keep coming back to. 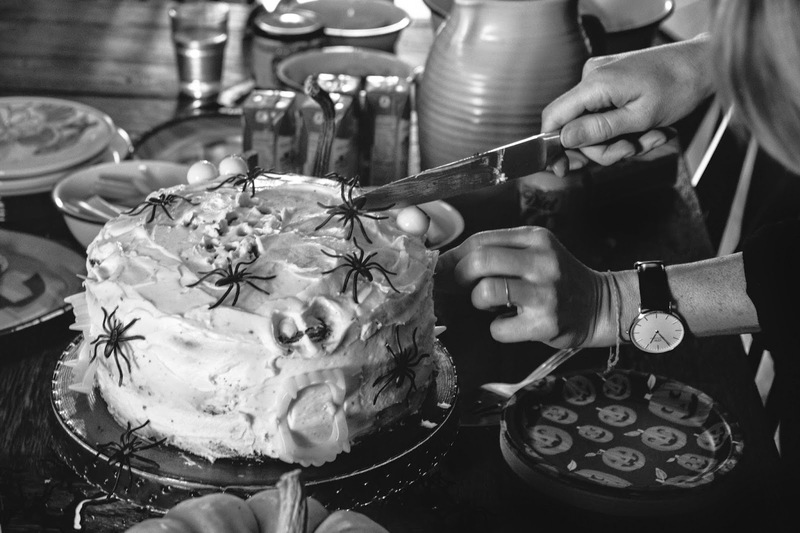 All of Huck's friends and all of Huck's friends' parents were all huddled together around the dinner table waiting expectantly, our hands frozen in place and ready to cheer, just waiting for that last little flame to disappear into tiny wisps of smoke before erupting into applause. We were making that kind of halting "ah!--oh!--" noise as Huck blew and blew and blew into that last burning candle, and just as the flame finally went out, and just as Huck stood up tall and threw his arms in the air in triumph, out came this explosion of voices and clapping and noises, all these friends, all these kids and these grown ups, all so genuinely caring and loving and supportive of my baby, of my family . . . it was just such a moment of real, shared joy, and tears sprung into my eyes and I realized again, just like I do every day because of mostly silly things, how we have it pretty dang good over here, and we are so so fulfilled. Because of this boy. My boy is just the loveliest. Huck is a magnet for every good thing in orbit in this universe. He brings all the best things with him where ever he goes. He is the light of my life, I tell you. He is such a pleasure and such a gift. I am grateful for him every day. What a seriously cool person I gave birth to. Happy Birthday, Huck! FOUR!!!! I sure do love you to bits. This year we had a little help from Mindy Gledhill! A quick bonus track, Anchor, my very favorite Mindy song of ever, live from our roof! Thanks, Minds! We love you!! p.s. Statue of Liberty on Mindy's right, Freedom Tower on her left. i forgot about moon river birthday tradition. totally cried. it's my favorite. maybe a guest artist on mindy's next album?? your voices go so well together! What a perfect and lovely party. He'll remember that always. I love the Moon River tradition! What a beautiful sentiment. This is gorgeous, your boys are gorgeous, you are gorgeous. I love how thankful you are for everything - it really makes me think about my own life. 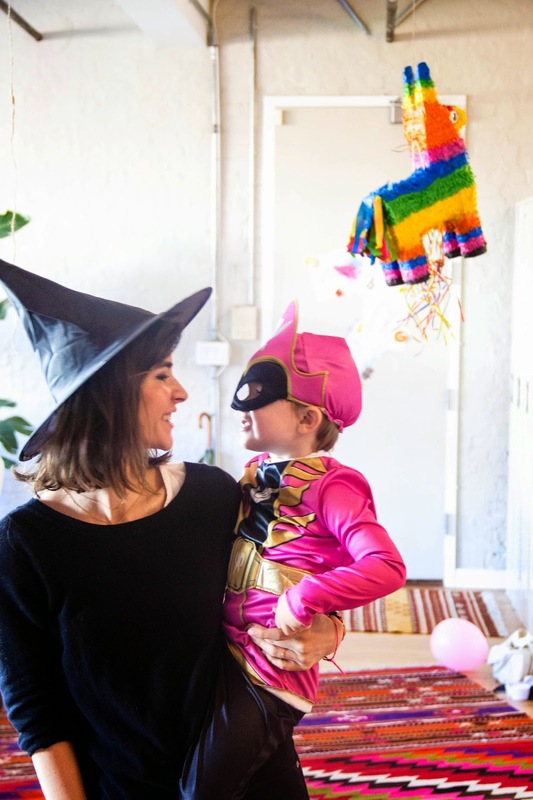 This entire post made me so happy and brought a tear to my (usually stonily dry) eye! I wish you and your family all the bloody love in the world. so sweet! moon river is the greatest song ever, and you sing it so beautifully. Such an amazing Birthday party. Makes me miss Halloween. Huck is so lucky. Truly. cheers from buenos aires!!! you should come visit, youre wellcome anytime!! These photos are adorable!! He's getting soo big! 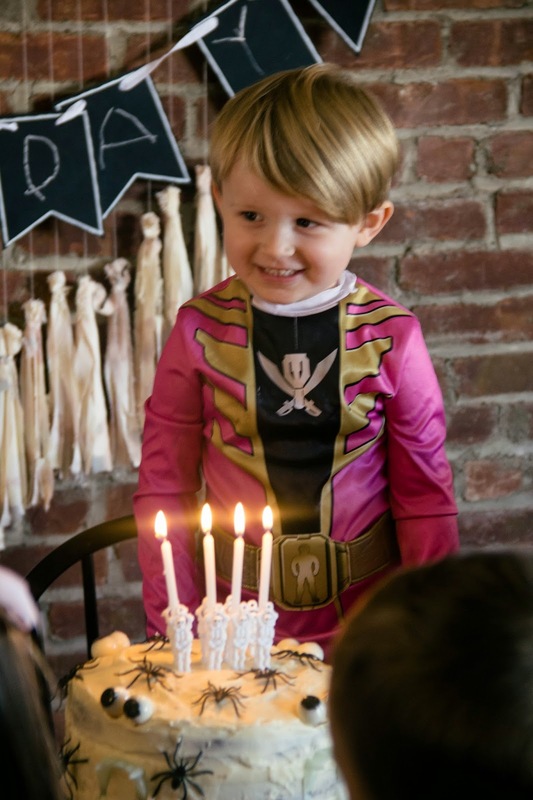 My son just turned 3 on 10/29 so we also have the Halloween theme to always fall back on. It's crazy how fast they grow! 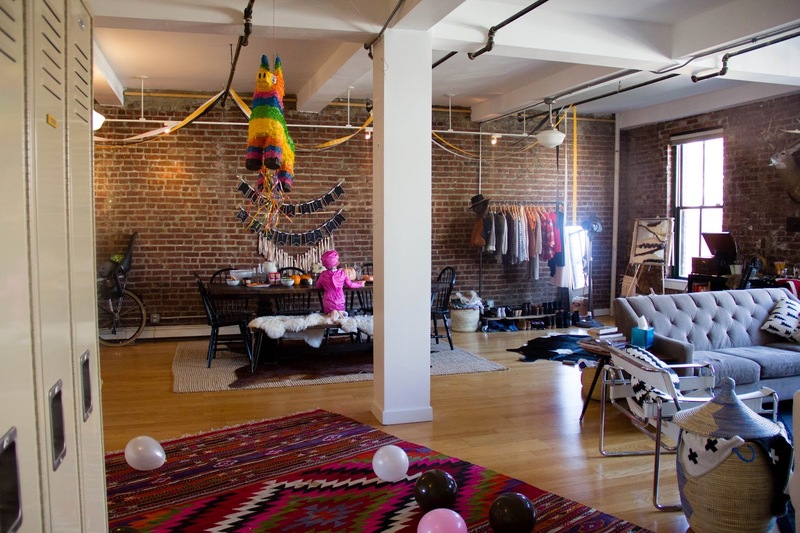 I loved his party theme. You did a great job!! 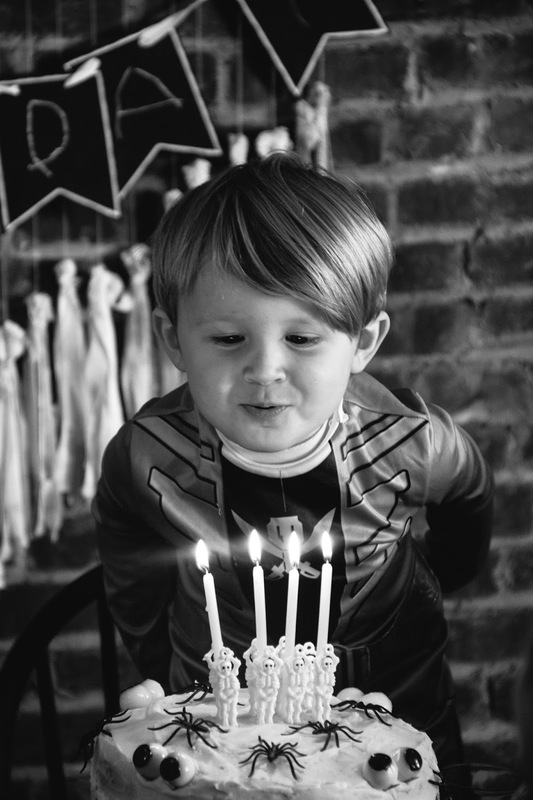 That B&W pic of Huck blowing out the candles is the sweeeeetest!! Mindy Gledhill is one of my favorite artists! Such a lovely version you guys! Like seriously I would buy it. Anchor is my favorite album. Huck is too cute! It looks like he had a happy birthday! Good call on the spider finishing touches Brandon. Love Mindy Gledhill! This all looks amazing, Huck is about the cutest thing ever, and honestly so are you. I just found this blog recently and I just keeping coming back- it's so good! I have a four year old too, and while it's hard to pin down, I just have a soft spot for that age, they are so funny and full of life. 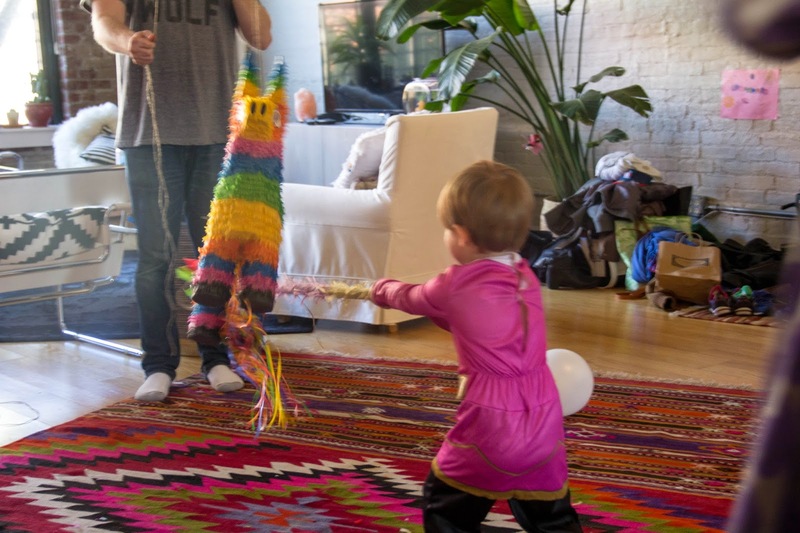 This is such a cute party!! You did a really great job! Simply adorable! Love the whole halloween theme, and decor! You have the sweetest family! Happy fourth to Huck...you'll just love four! (mine just turned five!) time flies for us mamas! You look so cute here Kennedy! Loving that coat! that is one happy kid! This is kind of hard for me to swallow, because Huck still seems like he should be a baby. But then again, so does my own 4-year-old. The lullaby is so touching...and you BOTH have lovely voices. FOUR - wow. Can you tell me where your husband's "part wolf" T-shirt is from?